Both get the same salary. My wife and I, both now very Old Latins, thoroughly enjoy the ‘dip’ into the Latin School online missives, decade by decade, staff pen portraits and general historical data and detail through to modern times. In comparison with our experiences during the 50s the modern era is way beyond our ken! 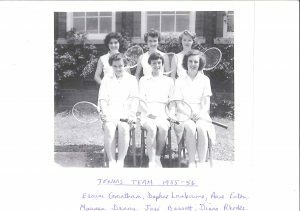 With an approximate school population of 180-200, over a thousand less than the current number of pupils, everyone knew everyone else and it had a ‘big family’ air about life at the Latin School. As in all families there were the positive, sure-footed, ’swim with the current’ majority balanced with the few who were more the ’black sheep’! My wife of 54 years, Daphne nee Lambourne from Swanbourne (the third of her family who were successful pupils at the Latin School. There was elder brother, Peter, and his younger sister, Barbara, before Daphne) thoroughly enjoyed her maturation seven years in the old building in Chandos Road and finishing (polishing and burnishing) off at Grenville Cottage. My five and a half years found me unfortunately, and very unwillingly, among the ’black sheep’ members of the ’family’. This was disappointing , for I revered the place and arrived full of enthusiasm for education, sport and fun within the ‘family’! We both agree that there were some excellent teachers in attendance to willingly and eagerly provide us with the sort of education such an ancient pile deserved in its post World War era. Much has been written and displayed on the RLS Alumni site extolling the virtues, talents and superb abilities shown by many of our icons of education, not to mention the irascible Serg our caretaker. Sometimes, as far as I am concerned the reports can, and do, reach sycophantic levels. I do not mean that statement in a cruel or doubting manner, but more in the way of one person’s paragon is another person’s persecutor. There is no doubt that members of staff such as Miss Merritt, Miss Fox, Mrs Creighton and Mrs Capel we both admired and revered, as opposed to Squealier (Mrs Duncan), the art specialist! Daphne and my interest, bordering on fascination, for geography in all its aspects is down to the gentle Miss Merritt and her knowledge and enthusiasm for the subject. Our ability and mastery of the French tongue, initiated so admirably by Miss Fox, served us well at school level, but without her drive we faltered and reversed, I’m afraid! Lottie Capel, where is she now? She is probably the most remarked upon in our household due to her insistence that our beautiful language should not be adulterated in the fashion it has lately become. We still scream at the tele and radio when even seasoned pros make glaringly basic errors in grammar and syntax. I am sure she would approve of all the books and articles I have written, with help from Daphne my editor, for and on education for children and adults. Among the men there were Bryn Evans, Tommy Allitt, Smith, Brown and dour, phlegmatic Mr Bush along with the inimitable Taffy Williams. There were others, but not, I’m afraid, attaining to our mutual agreement. These included Mr Gray, Robinson, Archer and Embleton. No I haven’t left the best to last but remember we are now into my humble opinion, which is not necessarily supported by Daphne! Bryan has to be the most outstanding person and teacher of our era. Both of us were allowed to blossom musically with his guidance, help and immeasurable musical talent. I still rue the day he left for ‘pastures new’ in Germany. Daphne and I both became real G & S aficionados due to Bryn, plus the back-up team of other staff members, including a non-member, Mrs. Bush. Daphne was able to squeeze in four operas to my mere two. These were The Mikado, Iolanthe, Patience and Ruddigore. 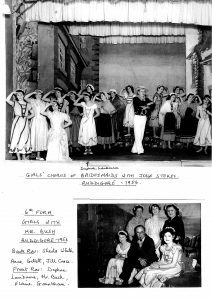 She says she was too shy in the first form to be in the chorus of the Pirates of Penzance, whereas Daphne’s sister, Barbara, now eighty-two and still singing in her local choir, says she would have stayed at school for another year if Bryn had told her that he had her in mind for the principal part of Mabel. This only came to light after she left. Bryn also launched the now rarely mentioned school orchestra which I had the real and genuine honour to lead, and he was also instrumental (sorry!) in encouraging us to join the County Youth Orchestra with sessions at Shortenhills for week long residential orchestral practice which included visits to local schools to provide not only orchestral music but choral works also. 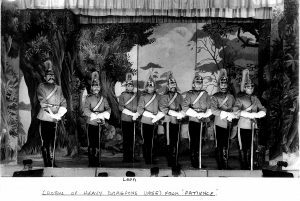 Maestro Evans also introduced me into the rarefied atmosphere of playing a minor violin role in the Buckingham String Players – a now lost and forgotten orchestra in the town, unless someone can tell me differently! As an aside I had to borrow my dad’s sports jacket to wear as, apart from my school blazer, I had no jacket! We both enjoyed performing with the school choir and, through Bryn’s influence, there was always great camaraderie among his ’workers’. As you will have gathered, for both Daphne and I, Bryn is in an elite group of one in our recollections (rose-tinted as they maybe!) For me only Mr Brown, teacher of mathematics in the early years came anywhere close to evoking the same very high respect gained by Bryn. Alas he left too soon and in his place we got (Mrs Capel wouldn’t have liked that ) Mr Robinson who shattered my confidence in his subject! Following the musical theme there was no :I (musical notation) when Bryn left and Rex Gray was appointed (yes he was appointed and certainly not anointed!) 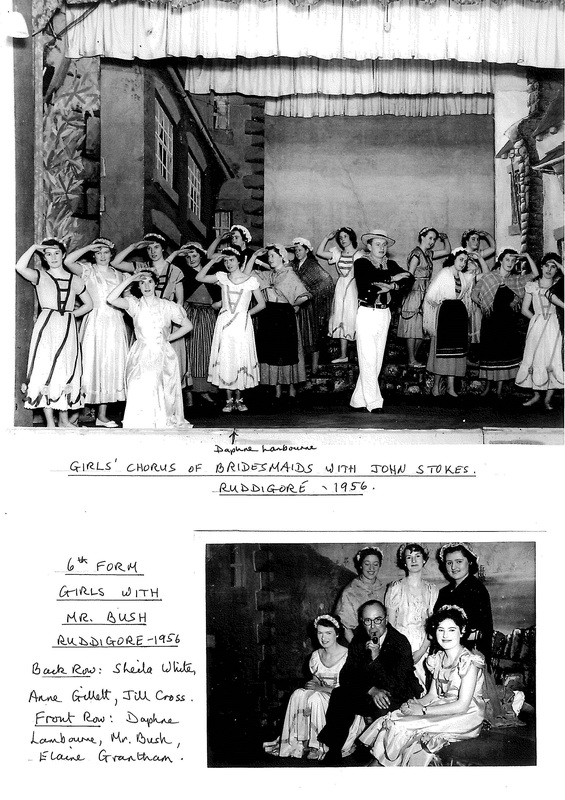 as the orchestra disintegrated and, I think, there were only two more G & S produced in his time – Patience and Ruddigore. Both of us enjoyed our sport although neither for the girls nor the boys was there a designated PE/Games specialist member of staff or a school field. Nevertheless both sexes played with gusto (our best coach!) and enthusiasm. 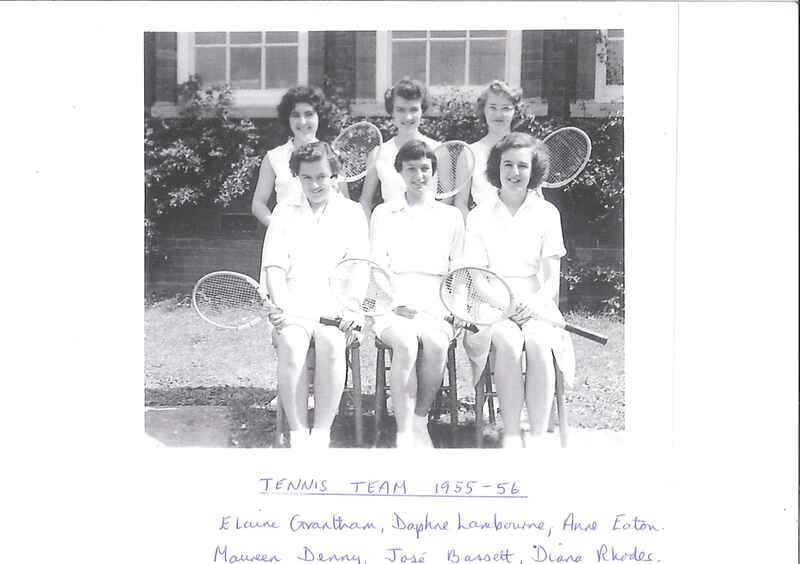 The girls had winter hockey on the Buckingham Town’s cricket pitch and summer tennis on the single hard court on the Chandos Road site augmented by the Town’s red shale courts on the right towards the station. These had to be ’dragged’ with sacking attached to a wooden bar after play and before the girls went home! To help with the girls, and our early winter preparation for hockey and rugby respectively, the boys allowed themselves to be ’beaten-up’ St Trinians style by the girls hockey team! Common to all, and at the above venue, the summer athletics house events were performed. All except the long jump, which was behind the school’s tennis court, (sounds a bit illicit put like that). It reminds me that the bike shed was on the raised area of the boys’ playground while the lower level still contained the air raid shelters. The similar area at the other end of the building was filled with a wooden structure which originally served as an art room and later as a dining hall. The boiler house coke supply was also piled in this general location. Back to the athletics and the cross-country course for the boys after this digression. This route has been well reported elsewhere, so I’ll the keep the boredom factor low on this one by stating that it included all boys in the third form and above, and on the return leg the milk factory smell was guaranteed to make you feel sick! For the boys there was rugby on the field accessed by means of the arched building opposite the Old Gaol – now a retail market area! (Football was the game at RLS up to the winter season prior to 1951.) The first notable rugby game, I understand, was versus Banbury Grammar and the result, as might be expected, was a heavy defeat by the larger rugby playing school by 75 – 0! As 1st Formers this was deeply shaming and with words unspoken but with thoughts and deeds concentrated, revenge was the aim. In my final ever game in 1957 I played, as pack leader and loose head prop, and we beat the larger Banbury School, for the first time, 3 – 0, justified and vindicated. 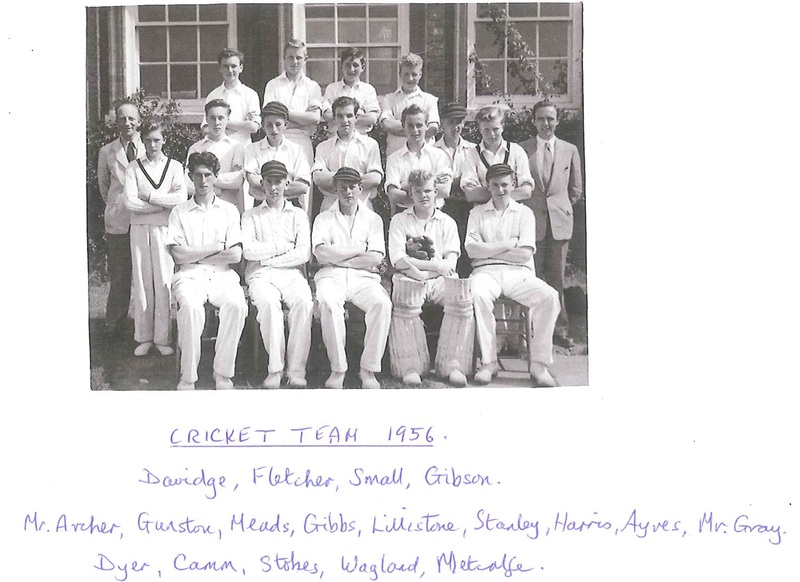 It was in the pre-Christmas holiday period that ’Figgin’ Archer put up a list on the Games notice board to the effect that the ‘following 1st team players had been selected for a County Rugby Trial’. The whole team were aghast as my name wasn’t on it. As pack leader, goal kicker and a key member of the scrum, I was (bravely!) devastated but said and did nothing. Others, however, did, and four members of the pack formed a deputation to meet Figgin to inform him that if Lee Metcalfe wasn’t good enough for a trial then neither were they! I was added to the list! Post match ‘Figgin’ rushed us together back to his car, as I protested that I did not know the venue or details of the first county match which subsequently I discovered was against Northants in their county. ‘You’ll be informed by post at home during the Christmas holidays!’ he said and off we drove back to Buckingham through the fog. I must have almost worn out the hall carpet at home every time the postman called, but there was never a thing for me, my most miserable Christmas ever! This misery was compounded by an immeasurable factor on the first morning of the new January term. As the saying goes, ‘My feet didn’t touch the ground’ before I found myself in front of Embleton’s desk and, in a daze, I heard, “What a disgrace you are to the school . It has never been let down so badly in such an appalling fashion in all its history.” I was bemused as I had no idea what he was talking about! Well you guessed it – I hadn’t turned up to represent the school at County Rugby level. My response, “But, but!” “No excuses you will never represent the school again at this level and you are wrong, Mr Archer says he gave you venue and time of the match before you left Halton!” Well then there you have it, I’m a liar, Embleton has acted promptly and decisively with no ‘ifs’and ‘buts’ because Archer would never lie, or be misunderstood would he? Both Daphne and I achieved a sufficiently high level for the School’s standard to be awarded our ‘colours’ in both winter and summer team activities. It was a little more exciting for the boys for in cricket we were awarded badges and caps. The latter meant we could rummage in the staff room cupboard and find a red and black alternate circles on caps which unfortunately were all moth-eaten! I still have mine and no further moths have had a chance to get near it. I still have my boxing gloves, given to me by our village vicar, which I used in training down at the Oddfellows Hall in town, on the other side of the river where, after school, three of us, Tich Joel, Geoff Harris and myself were taught the noble art by an ex-army person, whose name I forget, who gave up his time to train we three enthusiasts! This very same gentleman, at the same venue, used to take the boys for very a ‘very robust’ form of PE + gymnastics and he would brook no sagging, bagging or shying off when the ‘box and horse’ were in use! I used to fear for some of the less physically-minded among us who hated it and him! I think we went swimming twice in our time at RLS. A bus collected us to take us somewhere towards Brackley where there was a very rustically, primitive open air pool. Not many of us could swim in those days pre the building of the Buckingham pool on the right of the river bridge. This pool has now gone, I think. At Brackley the water was always very cold and only the frogs in the hand rail channel seemed to enjoy it – very few, if any, of us did! 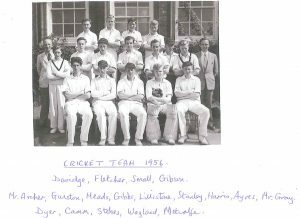 Everyone knows Embleton’s game was cricket, when he wasn’t playing football, and he persuaded Austin Matthews of Glamorgan and England to do some after school coaching at the nets. (I think he was officially employed at Stowe for their teams.) I got on very well with him and he made a useful natural right arm fast swing bowler out of me. In 1955, Jackie Camm, was a very good accurate bowler, and I opened the bowling for the school. I was turning in figures of 5 for 15, 5 for 10, 6 for 18, and even 8 for 20 under his tutelage in that year. Embleton was strangely possessive about his sporting boys, much in contrast to my previous report for, as far as rugby was concerned, he never watched the team but insisted that we should only play for the School. About this time the, now very thriving, Town Club had started. As far as I was concerned if I was coming in to school for a match, home or away, on the Saturday morning, I might just as well stay in Buckingham and, after lunch at Baron’s Grill, travel and play with the Town team in the afternoon, but it had to be incognito! I think Embleton must have had a good War, a good literary degree and at least one good friend in order for him to find himself the head of a prestigious ancient pile as the Royal Latin School was and is. He was no teacher, and our ways parted when I passed the Civil Service Engineering Examinations and also fixed myself up with a sandwich course at Bristol Engines, and, he, Embleton, suggested it would be best for all concerned if I left and joined the competitive industry in Bristol, which I did. I completed the course, decided to go to Culham College, Oxford became a teacher at 23 and headmaster at 29 of a larger school than the RLS and was thankful that Daphne had chosen to go to Fishponds College in Bristol so we could be together. When she took her first teaching post in Abingdon it meant that we were still together while my three year college course lasted. In fact we married at the end of my first year and we have now been together for a total of 58 years!